The sport of gymnastics requires a great amount of discipline and determination. We believe it is extremely important to develop and help to instill these attributes in young gymnasts as early as possible. The PreCompetitive Program is designed to prepare young gymnasts for future competition by emphasizing strong basic fundamentals, strength, flexibility, discipline and respect for the sport. Gymnasts are hand selected for this program based on their attitude, work ethic, desire, gymnastics skills, strength and flexibility. PreCompetitive gymnasts at Motion Matrix are provided with a challenging, disciplined environment to further build their abilities with other gymnasts who share similar potential and desire. Training will maintain a balance of seriousness and fun, and the entire experience will be extremely enjoyable for children who are passionate about the sport! In addition, Motion Matrix prides itself on teaching correct gymnastics technique. It is vital for long-term success. All gymnasts will learn gymnastics safely through proper skill progressions, strength and flexibility training, as well as necessary mental preparation. 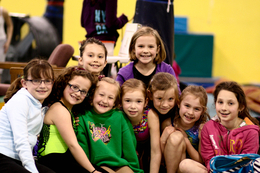 Hot Shots was specifically designed to meet the needs and challenges of our young gymnasts who have demonstrated great body awareness, control, strength and listening skills. There are very specific goals that we are focused on achieving. Children in this program have been hand selected by a member of our staff for their skills, determination & personality. This group is expected to participate in our community exhibitions, allowing them to showcase their talents and promote the program. This class meets 2 days per week for 1 each day and requires the purchase of exhibition attire. Gymnasts at this level must make the decision whether to continue their gymnastics career as a member of our competitive team (if invited), or to remain in the non-competitive level. They will be prepared for competition, with the main focuses being shape training, mastering core skills, increasing strength and flexibility, and endurance. In addition to preparing the gymnasts physically, we strongly believe in training them to cope with the inevitable mental adversities they will face in gymnastics that may include, fear, doubt and struggle, while building a foundation of confidence and pride in accomplishment. Teamwork and respect for fellow teammates is also emphasized. Curriculum will be based on Junior Olympic Levels 1, 2, & 3 progressions. This class meets 2 days per week for 1.5 hours (3 hours total per week) and requires the purchase of exhibition attire.